The heat-labile enterotoxin beta subunit is an important pathogenic factor derived from the enterotoxigenic Escherichia coli and other pathogens. It causes diarrheal diseases responsible for more than 650 million cases, resulting in almost one million deaths every year . The LTB gene was domesticated and standardized as a GoldenBraid part and cloned into the pUPD2 entry vector. The CDS was subsequently assembled with the constitutive promoter P35S from Cauliflower Mosaic Virus, and its terminator (T35S). 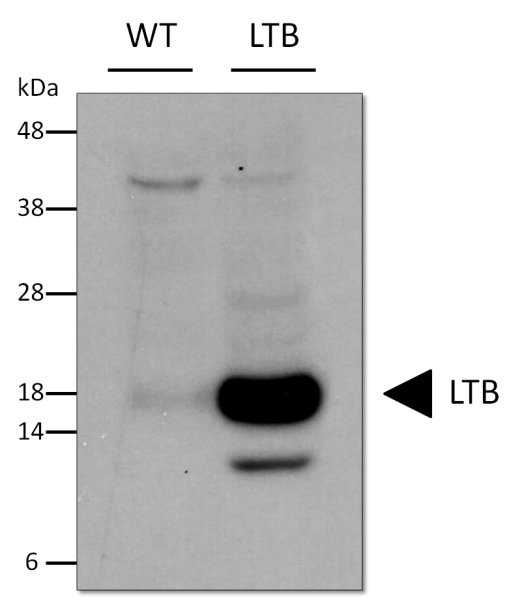 The transcriptional unit was then introduced into Nicotiana benthamiana by Agrobacterium-mediated transformation and the expression levels of LTB was detected with a Western Blot analysis employing an anti-6xHystidine antibody. Figure 1. Immunoblot assay of the expression levels of LTB protein in N. benthamiana leaves.